I am not one to throw religion around and I am definitely not one to preach to anyone. Believe and follow what and who you want in a peaceful manner without throwing it in peoples faces, that's usually my take. 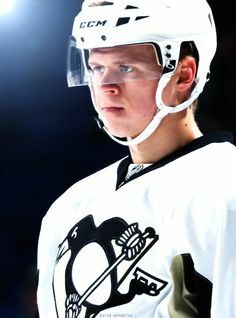 But I am sure many of you have heard the phrase "God only gives us what he knows we can handle"
Apparently God must think Olli Maatta is some sort of super human (although I thought Pascal Dupuis already filled that role). Since his rookie season, which was phenomenal, the kid has faced more than any twenty-one year old should. Struggling to find himself, his feet and his game once again....in progress and getting worse. His struggles are well documented. These setbacks have taken Maatta off the ice for just about as much time as he has been on it. Since being thrown back in the line up paired with Kris Letang, Maatta has been skating like a zombie wearing cement skates. He is lost out there and 2-3 strides behind everyone else on the ice. Hustle is non-existent and he just looks disengaged. The sky is the limit for Olli when he is healthy which the management showed confidence in when they extended his contract for 6 years. So what is wrong? What has happened to our Prince? Some writers seem to think Maatta is playing hurt. The idea is not entirely of base. The slow skating and overall movement and reaction timing could be due to nursing a nagging pain. I don't buy it. Not one bit. I know it is typical "hockey culture" to be as tough as nails and play through the pain, any pain, at any time but Mike Sullivan has made it quite clear with other player's injuries that they will not receive one minute of ice time until they are at 97% or above and fully cleared by doctors. This leads me to believe the "playing hurt" line is nothing more...just a line. The Penguins fended off the Rangers well enough with Olli in the line up but this is not the Rangers. This is the Washington Capitals. The best team in the league in the regular season. Juggernauts on the ice. You have to be physically tough as well as mentally strong and stable. You can't be on the ice looking as if you are lost in the woods. Maata is not only slow in skating and in reaction time, he is making questionable decisions when he makes them at all. His indecisiveness has led to him becoming the turn over king (which T.J. Oshie was more than happy to capitalize on). If you look in his eyes, the lights are on but no one is home. So let's call a spade a spade....the kid is EXHAUSTED! He is TIRED! He can't keep up with the pace and I am not the only one who thinks so according to one of my trusted sources and friends. Now before you crucify me, hear me out. He hasn't played a full season since 2013-14. He plays paired up with Letang which takes a lot of energy to begin with but when you are already trying to keep your head on straight and keep up with one of the fastest skaters in the NHL all while trying to not get injured again is enough to drive anyone insane. I am tired just thinking about it. He also has the anticipation of his required military service on his mind (I know, it's Finland, but it is still is a lot to take in. Military is Military). His conditioning is all off. He does not have the endurance to handle the amount of ice time that is being asked of him right now, if at all, this season. Letang is comfortable paired with him and we all know is Letang is a man of habit (aka OCD). But when a team is in Round 2 of the playoffs, what an individual wants has to be put aside for the betterment of the team. Olli Maatta has become a liability on defence and my suggestion to Head Coach Mike Sullivan would be to start exploring some other avenues. Look how well they were doing without Maata in the line up. You had Daley paired with Letang and Schultz with Cole and the "shut down" pair of Dumoulin and Lovejoy. I am okay with doing this again. At least Schultz was scoring and making plays. Give Pouliot another chance if a left-handed shot is needed. I am sure he would love an excuse to dump Oshie on his patootie. A change is needed, and it is needed now. What was displayed against the Caps in the first game was nothing short of a mess defence wise and it has to be better if they Pens want to move on. The tough call has to be made, put Maatta in the press box. Who knows, he might be okay with it if it means a better outcome for the team. Whatever it is that needs done, just do it. Olli, you are a sweetheart and I have no doubt you will rebound from this next season when you have some time to get yourself back to form. It's time to get him off the ice before he either A) gets hurt worse or B) the series get out of control.